My students involvement in this complaint about Gerald Quigley was reported last December in the Australian Journal of Pharmacy. AHPRA’s response was to ignore the concerns about Quigley, regard it as a matter for the TGA (who do not regulate practitioners) and close the case! Whereupon I asked for a re-examination of the complaint (appended). AHPRA’s response was to deny there were any problems. 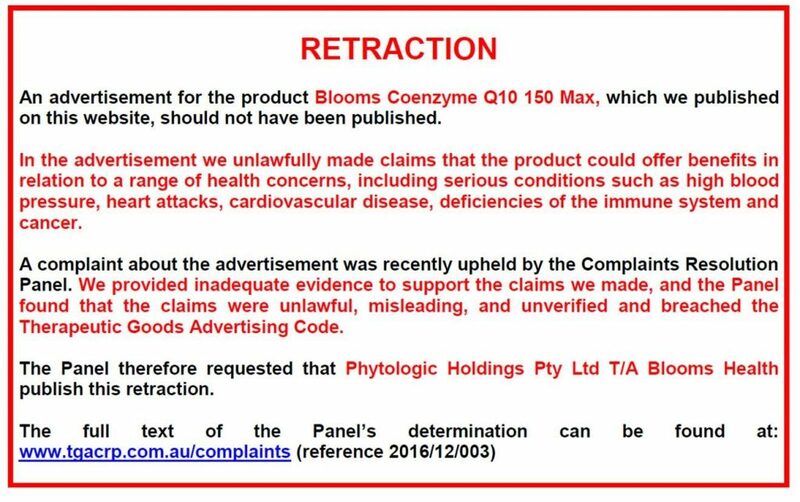 Now, we have the TGACRP determination about Quigley’s promotion of Blooms Coenzyme Q10 150 Max which includes a request for a retraction (below). Health Practitioner Regulation National Law Act. I’m emailing you about this matter as the letter received by my student from Camilla Worsnop (AHPRA Senior Legal Adviser) provided no contact email address or telephone number. I’ve attached Ms Worsnop’s letter and the original complaints sent to both AHPRA and the TGACRP. I have the following concerns. First, the AHPRA Senior Legal Adviser sent her response to my student, not kenneth.harvey@monash.edu as requested. Second, she did not address the allegation that Mr Quigley’s behaviour is in breach of the Health Practitioner Regulation National Law Act nor did she provide advice on whether Mr Quigley’s action constitutes a regulated health service under s 133(4) of the Act as requested. Third, she considered that this matter was more appropriately dealt with by the Therapeutic Goods Administration (TGA) and noted that a complaint has been sent to the TGA. This is incorrect. The complaint about the alleged breach of the Therapeutic Goods Advertising Code was sent to the TGACRP, not the TGA and it has been acknowledged as Complaint 2016/12/003 Blooms Coenzyme Q10 150 Max. However, given the current lack of resources of the TGACRP it will be 6-8 months or more before we hear the outcome of that complaint! In addition, the TGACRP can only consider a complaint about the advertising of a therapeutic good; they cannot consider a complaint about a registered health practitioner. Finally, no response was provided about the previous unanswered complaints about Mr Quigley sent to the AHPRA in 2013. I should be grateful if you could review this matter. I noted Bryan Sketchley’s response to our concerns (attached). I now attach the TGACRP determination of the complaint my students sent to them. e) to arrange for publication on the website bloomshealth.com.au, of a retraction in the form of, and in accordance with, the conditions set out in the attachment to this determination” (appended). In the light of this determination, I request that AHPRA revisit the original complaint by my students that alleged Mr Quigley’s conduct in endorsing this product was in breach of the Pharmacy Code of Conduct, AHPRA guidelines for the Advertising of Regulated Health Services and the Health Practitioner Regulation National Law Act. In my opinion, given Mr Quigley’s repeated (and serious) offences in this regard, I believe that he should be prosecuted by AHPRA, ordered by a court to pay a $5,000 penalty per offence and have a condition placed upon his registration prohibiting him from promoting &/or endorsing complementary medicines. I should be grateful for your response. This entry was posted in Uncategorized and tagged AHPRA, Blooms Coenzyme Q10 150 Max, Complaint Resolution Panel, Gerald Quigley, Pharmacy Board, TGA. Bookmark the permalink.